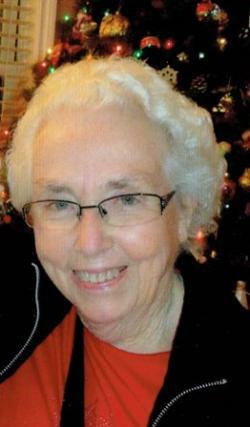 Rita J. Atkinson formerly of Riverview passed away at Fundy Royal Manor Home, Hillsborough, on Friday, January 18, 2019. Born in Moncton she was the daughter of the late Edward and Mary (Lyden) Wren. Rita was employed with T. Eaton Co. and CNIB. Survived by daughters: Brenda Price (George) of Hillsborough, Nancy Prince (late Robert) of Riverview, Linda Beaumont (Mark) of Edgetts Landing, Tracy O'Hara (Kevin) of Lower Coverdale; son, Bruce Atkinson (Rhonda) of Lower Coverdale; sisters-in-law, Geraldine Milton (late Reg), Elsie Horsman (Bill) and Bea Atkinson (late Ron); twelve grandchildren: Jennifer, Rick, Adam, Robin, Cary, Jeff, Virginia, Jessica, Mik, Courtney, Michael and Calvin; seventeen great grandchildren as well as several nieces and nephews. In addition to her parents she was predeceased by her husband Raymond in 2008; three children: Deborah, Raymond Jr. and Mickey. Arrangements have been entrusted to Tuttle Brothers & Riverview Funeral Home 214 Pine Glen Rd. Riverview, NB (506) 857-9544 where a celebration of Rita's life will be held on Friday, January 25th 2019 from 2:00pm until 4:00pm. Interment will be at Wilmot Memorial Cemetery in the spring. A special Thank-You to the staff at Fundy Royal Manor Home for their care and compassion. Wilmot Memorial Cemetery Lower Coverdale, NB.